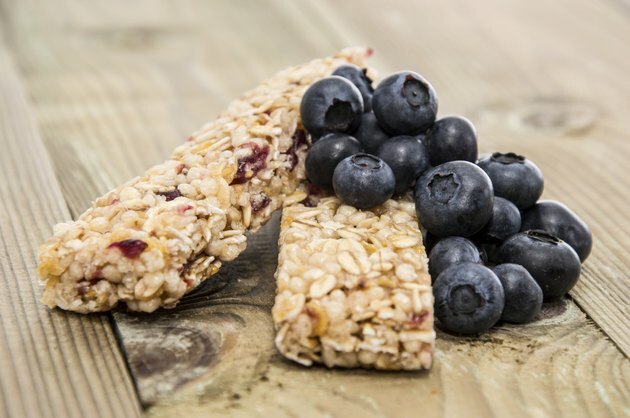 Protein bars are convenient, tasty and can provide quick nutrients for recovery after a workout. There are advantages to occasionally reaching for a bar to help you refuel, but before you do, it’s worth learning more about what different bars have to offer and how they stack up against protein-rich whole foods. Not everyone who works out is concerned with weight maintenance, but if you are, a post-exercise protein bar won’t do any harm and may even help. Bars that are designed to offer hearty amounts of protein can help you curb your total calorie intake, feel fuller and successfully lose weight. Protein is more satiating than either carbohydrates or fat, and occasionally eating a protein bar may also lower your blood sugar levels, especially if the bar is also high in fiber. As part of a weight-loss plan, a protein bar can also make a reasonable meal replacement and may save you hundreds of calories per day. There’s also evidence that protein bars can promote muscle gain when you eat them in conjunction with weight training. In one study published in “Nutrition Journal” in 2004, subjects who ate protein bars daily and participated in resistance training over a nine-week period gained lean muscle mass, but subjects who did training without protein bars did not. The benefits applied whether the subjects ate soy bars or whey bars, which points to the conclusion that the specific source of protein in your bar isn’t all that important. According to the National Strength and Conditioning Association, having protein post-workout encourages muscle gain, reduces soreness and accelerates training recovery. Protein bars vary widely in ingredients and quality of nutrition, and it’s worth taking the time to find one that’s healthiest for your needs. Personal trainer and metabolic disorders specialist Lisa Lynn recommends finding a bar with at least 15 grams of protein as well as several grams of complex carbohydrates and fiber. Ideally, the bar should have as little sugar as possible and no trans fats. Lynn recommends a bar that’s about 150 calories if you’re using it as a snack and a bar that’s about 300 calories if it’s serving as a meal replacement. Protein bars that are high in sugar and unhealthy fats can do more harm than good for your fitness level, as eating a lot of those substances has been proved to raise your risk of high blood cholesterol, heart disease, weight gain and other health problems. Protein bars that aren’t made with natural ingredients also offer a disadvantage, since they don’t have the high quality of nutrition and protective substances that whole foods do. Before you add bars to your regular diet, get the go-ahead from your physician or a registered dietitian. DoctorOz.com: Do You Know What's In Your Protein Bar? Bastyr Center for Natural Health: Protein Bars - Better Nutrition Through Science?